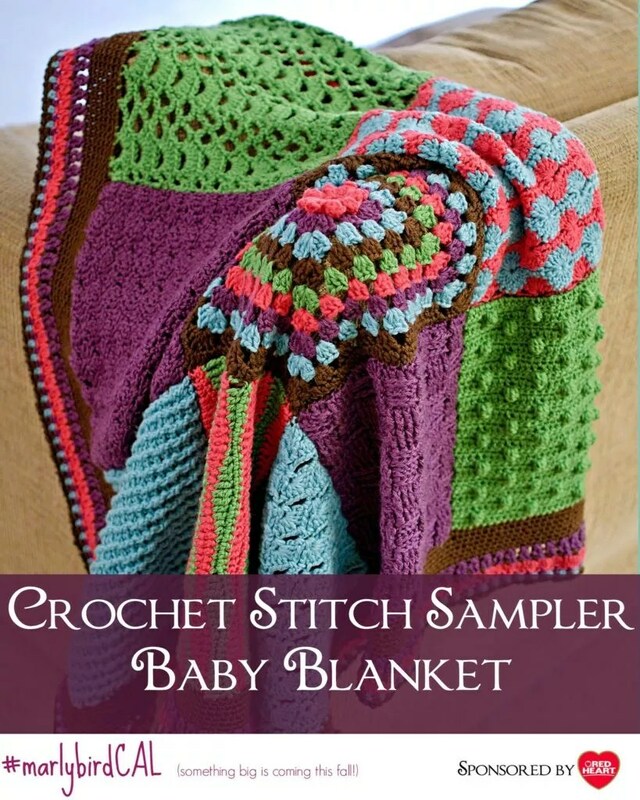 The Crochet Stitch Sampler Baby Blanket Crochet-along is sponsored by Red Heart and hosted by Marly Bird. This is the very first CAL I’ve hosted that is based on my own pattern and includes a full set of HD videos of me demonstrating how to do each step of the blanket! As a designer, I make a lot of gauge swatches. One day, I noticed that I had several swatches that were roughly the same size and fiber. I figured that I could seam the swatches together and make a quick baby blanket for my daughter. With this idea, came the pattern for the Crochet Stitch Sampler. 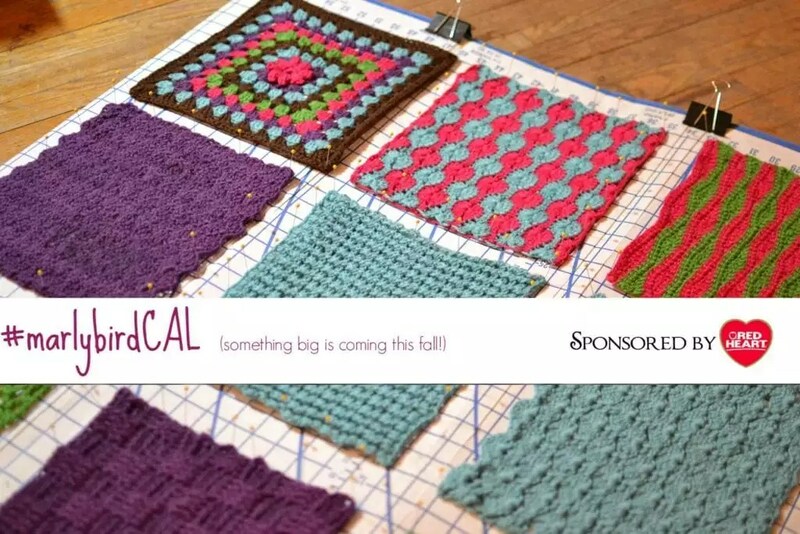 Given all the different stitch pattern books on the market today the sky’s the limit for blanket possibilities. By adjusting hook size and chain amounts to get a certain size it is possible to make any crochet stitch into a block. When you have several blocks that are the same size simply crochet them together and voila you have a blanket. This crochet-along will show you 9 different stitches used in my. In the videos I demonstrate how to make the ‘in class block’ so you can get used to the pattern and have the ability to make a full size square on your own. Once all the blocks are crocheted you will seam them together and add a border. Then, voila, you too will have a great baby blanket! The official start date is Sept. 22, 2015 – Oct. 30, 2015. There will be two videos released each week. There is a dedicated Facebook group for this CAL that is monitored by me and several of the WONDERFUL sampler crocheters who tested this pattern for me. We are all there to help you with this project. Please join us! You should really go and take a look at all the finished samples made by the testers. There are many different yarns used and color ways. They really are all so beautiful and inspiring. Some of the crocheters followed the pattern exactly and others put on their designer hat and used this pattern as a template to make their blanket their own! It was fun to watch them make their blankets. During the CAL timeframe each section of the pattern will be released at the same time as the corresponding video release. This will help everybody who wants to participate in the crochet-along (CAL) stay at the same pace and subsequently make it easier for me to help! Once the CAL is complete the full pattern will be available at MarlyBird.com. As I mentioned, two videos will be released each week during the CAL timeframe. In these videos I walk you though making this fun blanket and offer tips and tricks and suggestions to help you crochet the perfect project. Here is a link to the introduction video #1. You will be able to find all the videos at: http://www.YouTube.com/MarlyBird. Suggested Yarn: Red Heart, “With Love” (100% Acrylic; 315 yds/170g): 1 skein of 4 different complementary colors and 2 skeins of main color. NOTE: Original was made with a discontinued yarn–STITCH NATION by Debbie Stoller™ “Washable Ewe™”: [for sample size blanket] 2 balls each 3903 Strawberry, 3540 Currant, 3501 Robin Egg, 3652 Clover; 3 balls each 3365 Earth. Hooks: you will need a variety of different sized hooks for this blanket. Use the hook size that will get you the desired square size. Some squares will require a smaller hook and others a larger hook depending on the stitch pattern. For the sample I used G/7 and H/8. Each stitch count given for the full square will result in approximately the same size square as long as you adjust hook size when necessary. There is a note given for each pattern stitch suggesting a hook size. If you want to learn more about how to measure for gauge check out this video. DESIGNER TIP: I found it easiest to wash and block each square as I made them to insure that each was the correct size. You can wait until all the blocks are complete to wash and block each square to the exact measurement if you wish. Doing so will make seaming easier. Oct. 27, 2015 WET blocking VS. Steam Blocking! ETA: I will make a paid for PDF available soon but the free pattern will always be available here on the website. I am using the Caron Simply Soft. It is working up nicely. Looking forward to learning to make this baby blanket. Really looking forward to doing this! So I’ve watched the intro and 2nd video but are we making the double crotchet ribbing in the main color or a complimentary color? where are the written instructions for 1st square? If there isn’t one this is no fun. Yes, these are all in US terms 🙂 Thanks for joining in on the fun! I can’t seem to find the written pattern. I would like to follow along using the chart method demonstrated in the videos. The videos are fabulous. I have looked in Revelry but chat seem to locate written pattern, Any help will be greatly appreciated. Hello, at the bottom of this page there is a list of all the parts of the pattern. Each is an individual blog post. At this time, that is the only way to get to the pattern. When I have a chance I will publish the pattern all in a for purchase PDF but the free pattern will always be available here on the website as is.